Our BIGGEST Exclusive Saving Ever. 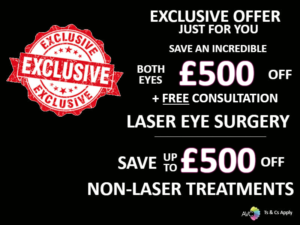 You can save an incredible £500 + FREE Consultation off laser eye surgery for both eyes. For non-laser treatments, we are also offering £500 off the following treatments: Cataracts/Clear Lens Exchange or Implantable Contact Lenses. Please note that slots are limited and are on a first-come-first-serve basis. Laser consultations will require a £100 fee paid upon booking. This fee will be deducted from treatment cost or refunded if found unsuitable and will not be refunded if you do not attend your appointment. ICL, Cataract/CLE consultations are £200 paid upon booking. This is not deducted from final cost of treatment or refunded if found unsuitable. Discount is also available on all eligible non-laser treatments for Interest Free Finance (IFF) up to 12 months when you pre-book and pay a £2500 deposit (deposit deducted from final cost of treatment. Up front payment of deposits are required to book a date for surgery, remaining balance must be paid within 3-4 weeks of the treatment date. Surgery must be carried out within 2 months of the consultation. All post-ops should be done at AVC’s clinic at 77 Harley Street. Additional costs may apply if you have a high or complicated prescription. You must QUOTE: PPC500 in the form.